New Mob Added: Vapula - A Crystal Elemental that has a chance to spawn from mining gemstones (Diamond, Emerald, Lapis, etc). Geonach and Aegis can now fuse to create a Vapula. Fixed a bug where the Aegis Defend Villager AI was broken causing exception log spamming and also stopping them from protecting Villagers at times. "ores" when true allows spawning from any ore block that drops itself as a block (such as Iron Ore) and also Coal Ore.
"gems" when true allows spawning from any ore than drops an item instead of itself (such as Diamond Ore), excluding Coal Ore.
By default, Geonach and Gorgomites now only spawn from rough ores such as Iron and Gold as well as Coal. Life draining mobs such as Ents, Epions, Chupacabras, etc should now all life drain correctly. Fixed a bug where mobs spawned from the Block Break type where positions slightly off center and could sometimes re-break the block they spawned from. ============================================================ Lycanites Mobs Update: Crystalline - Version 1.19.3.0 for Minecraft 1.12.2 Configs older than 1.17.3.2 will be reset. 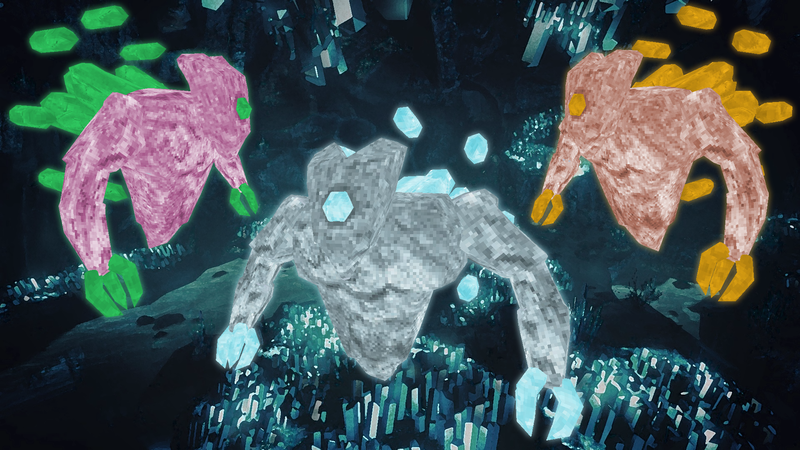 ============================================================ -------------------- New Features: -------------------- New Mob Added: Vapula - A Crystal Elemental that has a chance to spawn from mining gemstones (Diamond, Emerald, Lapis, etc). Geonach and Aegis can now fuse to create a Vapula. -------------------- Major Fixes: -------------------- Fixed a bug where the Aegis Defend Villager AI was broken causing exception log spamming and also stopping them from protecting Villagers at times. -------------------- Config Changes: -------------------- Add new "ores" and "gems" boolean values to the Ore Spawn Trigger: "ores" when true allows spawning from any ore block that drops itself as a block (such as Iron Ore) and also Coal Ore. "gems" when true allows spawning from any ore than drops an item instead of itself (such as Diamond Ore), excluding Coal Ore. -------------------- Changes: -------------------- By default, Geonach and Gorgomites now only spawn from rough ores such as Iron and Gold as well as Coal. -------------------- Minor Fixes: -------------------- Life draining mobs such as Ents, Epions, Chupacabras, etc should now all life drain correctly. Fixed a bug where mobs spawned from the Block Break type where positions slightly off center and could sometimes re-break the block they spawned from.